Wella Kolestint is the new hair color in the Indian market. Launched by Dimple Kapadia & Jacqueline Fernandez, I found out. I wanted to lighten my hair about 2 levels. There are 10 levels of hair color ~ 1 being black & 10 being lightest blonde. 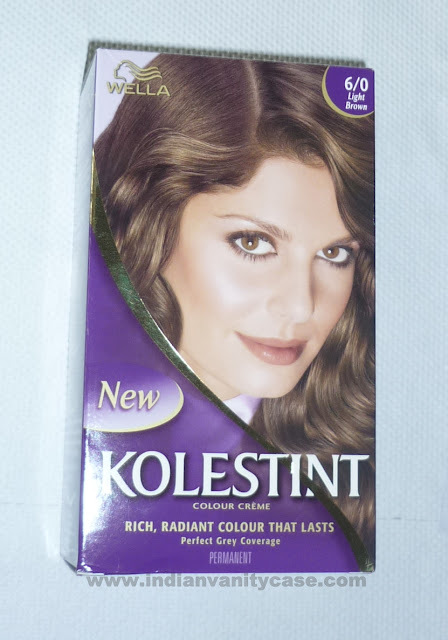 My first choice this time was Revlon Colorsilk Light Ash Brown (which I've used before), but it wasn't available at my supermarket, so I picked what I thought was the next best thing ~ Wella Kolestint Light Brown #6/0. I was excited to try something new for a change. 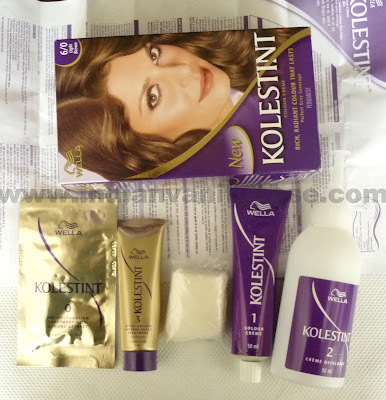 The box contains: A pre-color Treatment with Almond Extract, After Color Intense Shine Treatment/Conditioner, 1 pair of gloves, 1 tube of colour Creme, 1 bottle of Creme Developer, Instruction leaflet. *If you have longer and thicker hair than mine, you will need 2 boxes. This one was just enough for my hair. I use a hair color mixing bowl and brush of my own. I find it easier to apply hair color with a brush rather than right out of the bottle. My hair color before was a medium brown, say level 4 with a few unintentional highlights from a bleaching job that went wrong. After using Wella Kolestint 6/0 Light Brown, my hair turned a level 2-3. I am quite disappointed that it didn't lighten my hair. It did make my hair more shiny. But if I wanted shine, I wouldn't have picked a hair color now, would I? And it's physics: the darker your hair is, the more light it will reflect. This is not the first time a Wella hair color has disappointed me. I once chose an Ash Blonde at a salon and it turned out almost black! For me, it's goodbye Wella! No, FAREWELL actually. Have you had any bad hair color experience? Do share. u r rt! ur hair looks black and definitely, it has shine! I am so glad you reviewed this! I had been eyeing this for some time, but was not sure whether to get it after my diaster with the L'Oreal Casting Cream Gloss - The color I chose was a burgundy shade & all I got was a hint of burgundy that too when the sunlight wld hit my hair.. Otherwise my normal dark brown hair would appear black..
Not getting this now. All these DIY Home Kits give very variable results..
oh noo, damm. 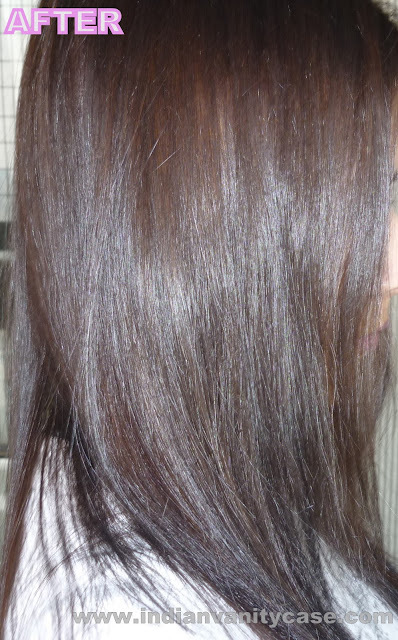 I dyed my hair twice and it didn't really go well for me, the colours didn't even show up, so =( I was pretty disappointed. Wowwwwww it's gorgeous Cynthia...Love your hair!!! And yeah thanks for this review, I was thinking of buying it but now I'm not. I see subtle streaks of color, but nothing noticeable. I haven't had any bad experiences with hair coloring, oh wait I have! It was getting closer to my high school graduation and my mom thought it would be cool if i did lighter streaks. So we tried some hair color and I guess I kept it longer than I was supposed to because my hair turned - orange! yes, that's right my hair turned orange! I had a good laugh for 5 minutes and died my hair black again. lol. My hair is very absorbent for color, I could go blonde without bleach too, not that I want to. nest time if u like the color u see in the box. Don't exactly pick that color. Pick more lighter then the exact shade u like. Cause with the whole black hair u will never get the exact color u desire from the box point of view. Trust me, when i was 15 i actually went crazy with hair color, so i kinda have lil bit of experiencing what will come out with how? 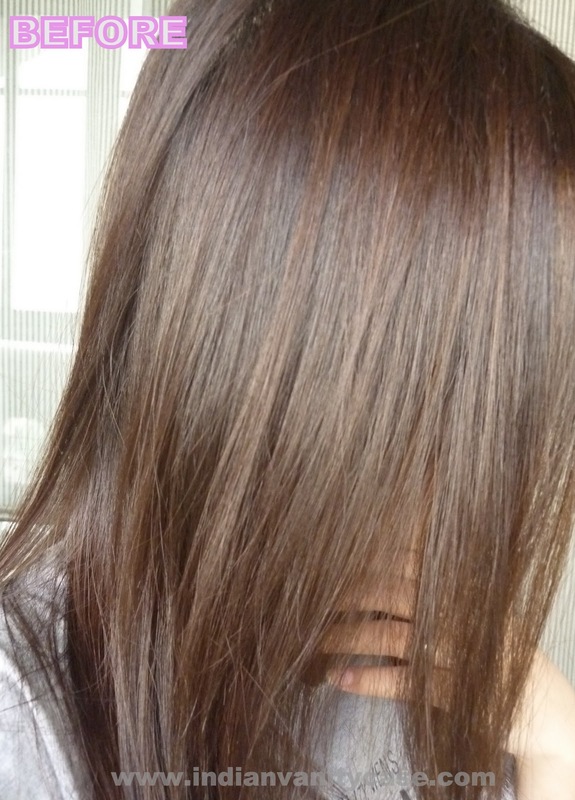 ^_^ but yeah after few washes ur color currently the one u have right now will go lighter ^_^. Bharti, unfortunately we don't get lighter at home hair colors here, unless it's at a salon, and that costs too much. Otherwise I would've definitely gotten a #8 if it was there :). The same happened with me too.I got L'oreal casting creme gloss in dark chocolate and it did nothing to my hair color.NOTHIN'!! I can't help but giggle when I imagine myself as a blonde. If I'll tan, I'll look sooo retarded. I kinda want to go red, though. Hmmm red streaks! Your hair looks good, but yeah I understand your disappointed since you wanted it lighter. And now it's darker. aww! but i like black on you :) it conceals splitends hehe. 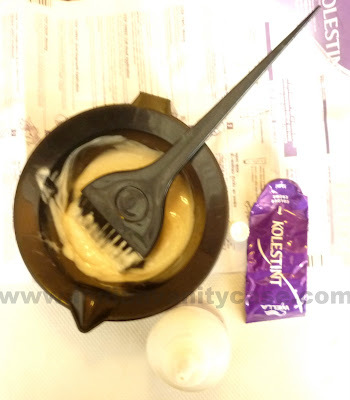 I have been a fan of loreal DIY kits and always used ash blonde in it. It always worked and gave me such a gorgeous *different* colour each time! :) try it! 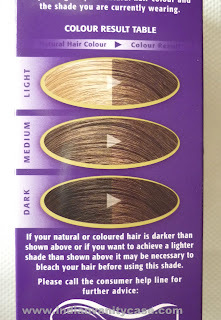 it did give shine to your hair but then you are right, darker the hair better light it reflects...I got the two shades from wella :( I just hope it turns well on my hair!!! Even though your hair was a 4 and this color was a 6 (which makes sense that you would buy it because it's 2 levels lighter than your original color), Color can not lift color. You should try a Hi-Lift next time. My friend used it on her light brown hair and she got a nice blonde out of it.... No bleaching required. Just the Hi-Lift from Sallys as well as 20V or 30V Peroxide. Afer that, you can use a demi permanent to tone your hair. Hope this can help someone in the future! Umm, no offense, but do your research before dying at home. Of course it didn't lighten your hair. 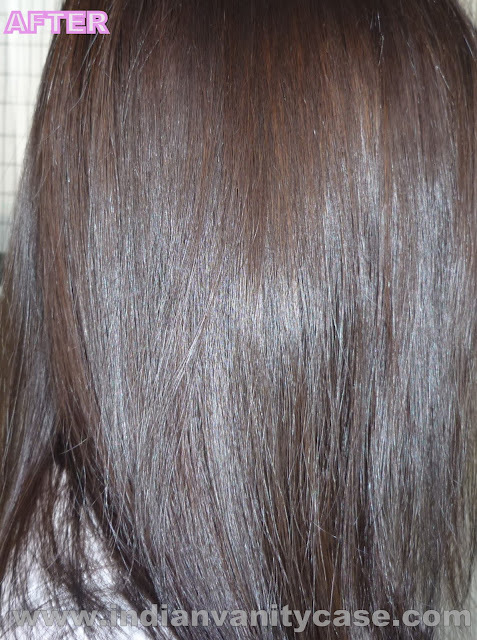 Hair color that is not high lift or not used on pre-lightened hair is simply adding pigment to what you start with. Bleach first if you want to lightened several shades. If lightening even a couple shades, at least use a high lift color. In my experience, Wella's dyes are fantastic, they just need to be used correctly.